It has a short and fat body, a small head with little ears and a short tail while its dark legs are short for digging too. The body is grey with a light-coloured stripe from head to tail and the face is black with white marking. The badger's main source of food is the earth-worm, but its diet can be supplemented by insects, rodents and the eggs of ground-nesting birds. It can also eat fruits ( apples, pears, plums, rasberries and strawberries) , tubers and grain. 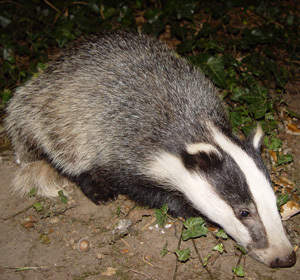 The badger is a nocturnal peaceful animal and lives in burrows called setts generally lined with bedding which consists of grass, straw and leaves. It can be solitary or form clans and retires to sleep in winter blocking the sett entrance with dry leaves and earth. The scientific name is Meles meles, in Irish it is called Broch. In Irish mythology the badger is told to be shape-shifters and kinsman to Tadg, foster father of the great king of Tara Cormac mac Airt. This Irish hero couldn't eat badger meat consciously aware that this animal was his cousin. In one story, when Cormac was a boy, he killed some badgers and brought them home for dinner, Tadg was completely revolted by the bloody meat appearance and refused to eat it.